Cradle a stuffed animal as if it is alive. Then turn to your class and say, for example, “How can we offer comfort to this little lamb? Could we read it a story?” Your question will teach kindness and prompt children’s creative thinking. A few years ago I had the good fortune to win a contest for creative ideas about the care of puppies. One resulting comfort to me? A big prize…a year’s supply of dog food that freed up some funds for family fun. Attention-getting lesson learned? Take smart chances, even if you risk losing. My smart move was to use a measure of writing and photography skills to enter the contest. Risk taken…It was fun to win the big prize, but from the moment that I decided to enter the contest, I involved my family in the exciting process, so it was worth it to participate, even though I knew that I might not win. Offer comfort to them, like we did to Julianna, our new family puppy on her first day in our home, by setting her down in a blanketed basket next to a stuffed animal that was so life-like, Julianna thought that it was her mother! The comfort that we offered…offered us a lesson in return. We learned about the power of make-believe in using stuffed animals to help children in need through difficult situations. Julianna napped for hours in the comfort of make-believe. Early childhood educators know about the power of make-believe and the attraction kids feel to stuffed animals that seem to come to life. Offer Comfort and Teach Kindness – Use make-believe in teaching kindness. One way to do this is to introduce children to a stuffed animal. Pretend that it is alive and a bit unsure on its first day in school. Tell the children the “animal’s” name (make one up that suits its appearance and your culture). Cradle the animal in your arms as if you are comforting it. Listen to students’ ideas. Ask a volunteer to hold the stuffed toy (young children will treat the “animal” as if it is real, if you do) while you post the ideas on the board. Note the connection to your class between the comforting ideas they have offered and the character trait of kindness. Elaborate on this concept as time allows and your curriculum directs. Close this activity by placing the stuffed animal in a special spot in class. Explain that the newcomer will be with you for the whole school term. Children will be delighted if you set the stuffed animal on a small blanket or piece of fabric. Ask if everyone agrees that a cozy place to rest will add to the “animal’s” comfort. A big benefit in offering comfort with stuffed animals is that the lessons offered in return are easy to deliver. You’re using the magical power of make-believe. 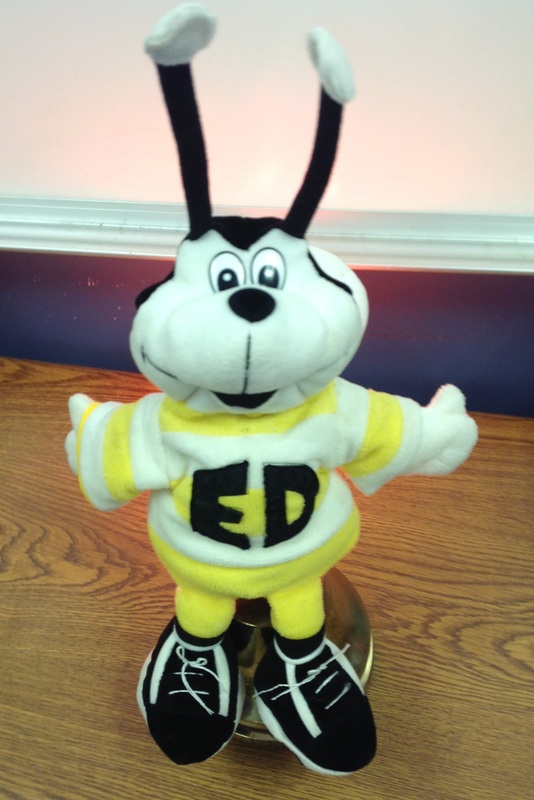 “Ed,” a lively bumblebee, offers comfort in helping kids know that they can learn from mistakes. Comfort Can Come Even When We Make Mistakes – Students (and teachers) are under a lot of pressure today. Pressure can cause mistakes. It’s comforting to know that even when we make mistakes we can be forgiven, perhaps even fix them, and always learn from them. Making mistakes can offer a lesson in return…It’s never too late to commit to doing “better” in the future. This lesson teaches responsibility, patience and perseverance – important components of character education. It’s a lesson that “Ed,” a symbol of character education in one school where I’ve taught, offers kids. “Ed” is a stuffed toy bumblebee. He buzzes about checking on students in class. He looks for kids who show kindness and respect, among other good character traits. Comforting Critters Can Teach Basic Skills – I took another furry stuffed animal to use in an after-school arts program for young children. I introduced the group to “Scamper, the Hamster” and showed the children how he makes a noise when you press his nose. The comfort offered…I told the kids that if everyone paid attention to “Scamper” they could take turns later hugging the “critter.” Hugs offer comfort. I advised the students that if they heard “Scamper” make a sound, it was a cue, a clue, for them to hush for a moment during class. Lesson learned? Following directions in school has benefits. “Scamper” worked like a charm, so much so, that on my following visit, children asked if I had brought “Scamper” back with me. Comforting Stuffed Animals Can Encourage Reading – Teachers and librarians who work with grades K – 2 sometimes use stuffed animals and dolls based on storybook characters to encourage reading. 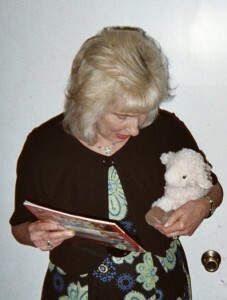 Some educators allow young students to “borrow” a storybook animal or doll to sit with while reading. Educators further motivate children to read by telling them that they will “help” the stuffed toy by reading to it…more adventures in the land of make-believe. Lesson learned…children – advanced readers and slower learners alike – discover that they have the capacity to help others, even if they don’t think of themselves as being skilled in a subject like reading. Offering comfort is wonderful to do anytime. Comfort that comes with lessons in return is even more special, especially if the strategy helps children feel secure as they grow. Please send comments on how you use stuffed animals and toys in school.